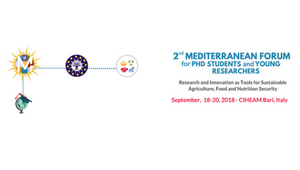 Following Montpellier successful 1st edition in 2016, CIHEAM launches this Mediterranean initiative for PhD students and young researchers to lay the foundation for a permanent forum for dialogue and communication in the field of research and rural development in the Mediterranean area. Enhancing research and innovation impact at national and regional level. Conducting research on the challenges of Mediterranean agriculture. A call for papers in the form of short abstracts will be launched on February 26, 2018. The closure date for abstracts submissions is set for May 18, 2018.